This reviewer has long been interested in the discussions about the existence of agents. 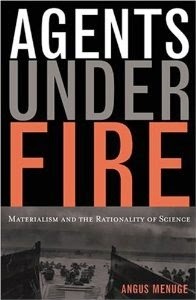 Since the teleological argument depends on the existence of design being a legitimate concept, and that being dependent upon the existence of agents, Angus Menuge's book "Agents Under Fire: Materialism and the Rationality of Science" (Hardcover, GoodReads) was quite appealing. This reviewer balked at the price on Amazon, but it was given as a gift, and this reviewer was ecstatic delve into it immediately. The book is 215 pages divided into eight densely packed chapters. This review is designed to be a chapter-by-chapter summary to prepare the reader to tackle this challenging text. Dr. Menuge begins the preface of the book by stating that his purpose behind writing Agents Under Fire is to defend the existence of agency (a non-natural entity capable of reasoning and purposing). He explains that this is a pivotal question in debates about intelligent design, for if there is no agency then there is no agents to design anything (to compare the "designs" in nature to)- design even is an illegitimate concept and should be completely discarded. Menuge defines two key terms for understanding the book: Strong Agent Reductionism (SAR) and Weak Agent Reductionism (WAR). SAR represents a complete "explaining away" of agency by positing that all decisions are the results of natural cause-and-effect systems- no thought, reason, or purpose are involved in such systems. WAR attempts to explain agency in natural terms- making agency a product of nature. He then offers some quick points of critique of each, but saves the deeper content for later. Following the definitions is a chapter-by-chapter summary that helps the reader get his or her bearings and recognize how the book will flow. Some people are tempted to skip prefaces of books, but this is a case where doing so will make following the book much more difficult. Menuge begins by listing the claims of reductionism: everything has mechanistic explanations, the best explanation of mechanisms is purely materialistic, and these explanations are the most fundamental of explanations. Menuge then explains three different types of reduction and provides successful examples of each from the history of science. He then shows examples of attempted reductions to mechanistic explanations in science that not only failed but increased scientific understanding by failure. He also shows that quantum mechanics demonstrates a reduction that is not mechanistic. Menuge concludes that there is no necessary ties between the progress of science and success of reduction or reduction and mechanistic explanations. From here he moves to discussing attempts to reduce agency to mechanistic explanations. Here Menuge provides a more robust definition of "agency." He distinguishes among four general positions in the creation-evolution debate and how they each treat agency. He then sets the stage for the rest of the book by explaining SAR and WAR in more detail. He posits that they are the only two options for the scientific materialist and that if either (or both) fail, there is no place for the scientific materialist to go except to deny that they are scientific or deny that they are materialist. Menuge concludes the chapter with an outline of the contents to help the reader digest and review the vast amount of content that was just consumed. Having laid a solid foundation in Chapter 1 Menuge now moves into the primary content of his book. He begins his examination of Strong Agent Reductionism by looking what it is attempting to reduce: folk psychology (FP), which is the average person's understanding of human behavior that allows him or her to successfully interact with other average people. Menuge presents the case for SAR as a case primarily against the reliability of FP. He explains four specific critiques of FP but also presents how SAR escapes them (the positive arguments). Menuge then offers four objections to SAR: abstractions, subjectivity, ontological foundations, and incoherence. He goes into detail of each one, arguing that either SAR cannot accommodate the realities or that it undermines its own claims. Finally Menuge argues that no scientific naturalist can affirm SAR without undermining the scientific enterprise itself. However he grants that many naturalists recognize the intractable problems with SAR and rather opt for the target of the next chapter: Weak Agent Reductionism. Weak Agent Reductionism (WAR) is the alternative to SAR. WAR grants that agency is real, but it attempts to explain it in materialistic terms. Menuge examines the arguments for WAR in general, including evidence that makes scientists believe that psychology may be reducible to biology, but he explains how this cannot account for intentional states of agents. Menuge then examines the specific position and arguments presented by Daniel Dennett, who offers that agency is the product of Mother Nature- though he does not ascribe purpose, foresight, or authentic agency to Mother Nature. Menuge offers four objections, three of which are revisiting the objections to SAR but uniquely applying them to WAR. The fourth objection is that Mother Nature is an insufficient source for true agency since it does not possess true agency. Menuge ends the chapter by explaining that neither SAR nor WAR are coherent for the scientific materialist to maintain. SAR sacrifices the rationality of science to maintain materialism, while WAR sacrifices the reality of materialism to maintain the rationality of science. He explains that rationality cannot be sacrificed, thus the only option is to reject materialism and accept traditional theism. Next Menuge addresses the very foundation of both SAR and WAR- biology. Both rely upon the evolutionary process to produce a complex system that can produce the illusion of agency. However before a system capable of such an advanced task can exist, natural processes must be able to produce complex system capable of much less advanced tasks. Menuge uses the concept of irreducible complexity to demonstrate that this cannot be accomplished. He provides the reader with an explanation of the concept, then a series of attempts by naturalists to explain (and naturally produce) such systems. Menuge then looks at each one in detail and explains how each attempt fails at its attempt. He concludes that because of the failures of all these attempted escapes, that evolution cannot be the mechanism that produces systems demanded by SAR and WAR. He further concludes that since evolution is the only mechanism in the naturalistic worldview, naturalism fails to explain agency. As if demonstrating that Darwinian mechanisms are incapable of accounting for agency in the biological realm was not enough, Menuge turns his attention to evolutionary psychology. He explains and defends the two primary perspectives: genetics determines explains "consciousness" and a combination of genetics and "memes" work together to explain "consciousness." He shows that regardless of which view is accepted, the "self" or "agent" does not actually exist. To counter these options Menuge appeals to the necessity of the self to explain the ability to perform practical and theoretical reasoning and the reality of a point of view. Menuge also addresses more nuanced naturalistic understandings of the "self" as consisting of multiple "selves" and the reality of a point of view as also being in multiples by appealing to the necessity of a single point of contact to bring all the "selves" and/or points of view into a single coherent experience of reality. After demonstrating the necessity of agents from both a physical and psychological perspective, Menuge now turns his sights on the reliability of our cognitive faculties if the naturalistic mechanism of evolution is true. He explains the two competing theses from the naturalist's perspective. The first posits that our cognitive faculties are adaptations based on the idea that ontologically wrong ideas lead to lower reproductive rates. The second neutralizes evolution regarding cognitive faculties and merely claims that it is not incompatible with naturalism. Menuge shows that if either of these are correct, then thought and behavior are necessarily independent of one another, thus selected behavior can have no effect on right or wrong thought patterns. He argues against this the truth of this independence, thus against the truth of either of the theses. He then addresses the perceived weakness of such a demonstration: the idea that a creature will still survive because the majority of their thoughts about reality cannot possibly be incorrect. Menuge explains and illustrates that practical false theories have permeated human history. He shows that this is due to the fact that there is only one correct understanding of reality, while many incorrect understandings (a good portion of which are practical). He then argues that as long as the understanding is practical, it can be selected for, and since the number of incorrect understandings greatly outnumber the correct one, they are much more likely to be chosen. Thus we cannot rely upon our cognitive faculties to reliably provide us with anything more than an incorrect understanding of reality that just happens to get us by. Menuge concludes the chapter by explaining that the naturalist has no possible place within their worldview to retreat to maintain the reliability of our cognitive faculties, and if they wish to maintain the reliability of their cherished scientific method, that they need to jump from naturalism to some form of theism. Menuge now turns to demonstrating the necessity of agents from a purely philosophical perspective. He begins by examining thought, itself. He explains that our thoughts possess both intention and design. They are purposeful and exhibit characteristics of plans- neither being possible by strictly naturalistic resources, and both requiring an agent. Menuge takes the reader on a tangent to explain information theory. He then uses this to show the specified complexity of thought and provide evidence that naturalistic resources cannot produce such patterns, while agents can. Thus he concludes that the existence and content of thought are powerful evidences of the existence of design and agents. In his final chapter Menuge examines the science/faith dialog. He uses Jonathan Wells' "Icons of Evolution" to show that it is disingenuous for naturalists to claim that religion cannot be part of the discussion in virtue of being religious. He then looks at several possible interactive philosophies between the two. He spends some time critiquing Michael Ruse's approach using some of the material already explained in previous chapters; then he offers what he believes to be the best approach. He concludes the book by explaining that both science and theology need an equal seat at the table, neither should trump the other, and both should be open to honest critique and alteration of models to find the truth of reality. As a defender of the Christian faith, this reviewer is always on the lookout for incredible works that take the discussions to the deepest levels. Since Brian Auten (of Apologetics 315) interviewed the author of Agents Under Fire (Angus Menuge), this reviewer has been looking forward to reading his book. It certainly did not disappoint. The philosophical rigor that Menuge offers in his presentation of his arguments and his critiques of opposing positions is awesome. He takes the reader deep, yet he writes in a way that is not dry and bland. He keeps the reader entertained while constantly challenging the mind. The depth of the philosophical discussion makes this a must own work for any apologist. The one warning that should probably be noted is that it is not for someone who is new to the discussions or barely familiar with philosophy. Those readers would likely be lost within the first couple pages. Agents Under Fire is one of this reviewers top recommendations for texts dealing with the existence of agents. As mentioned in the beginning of this review, the price is a bit steep, but it is worth every penny.